French lepidopterist J. B. A. Boisduval was the first to describe and name this skipper, from a California specimen. But Thaddeus W. Harris, working in Massachusetts, was not certain that his specimen was identical to that described as vestris by Boisduval. Harris named his Hesperia metacomet, after Metacomet, the Wampanoag chief, son of Massasoit, also called King Philip, who led the infamous uprising against the English colonists in 1675-6. Scudder, although recognizing that Boiduval’s 1852 description did fit the local species, adopted Harris’ name, calling it Euphyes metacomet. 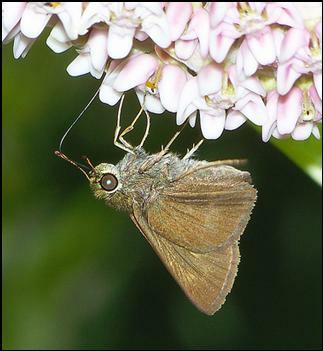 Today, our dark eastern form of Dun Skipper is designated sub-species Euphyes vestris metacomet (T. Harris, 1862); its type locality is "Massachusetts" (Pelham 2008). Several of Harris' "type specimens" are in the Harvard MCZ. Unlike its Indian namesake, Dun Skipper is rather inconspicuous. But it is the most successful member of the sedge-feeding Euphyes genus in our area, embracing a wider range of habitats and host plants than just the bogs, fens and marshes used by the Two-spotted, the Dion and the Black Dash skippers. In habitat and flight time it has more in common with Northern Broken-Dash and Little Glassywing, being the third of this successful trio of July-flying single-brooded skippers. Opler and Krizek (1984) term it the Sedge Witch. Dun Skipper has a large range, covering the whole of the east coast from Florida to southern Maine, across Canada and through the mid-west to Colorado, with a disjunct population on the northern west coast in the United States and Canada. The earliest known Massachusetts specimens are three collected in Cambridge, Massachusetts on 10 July 1833 by Thaddeus Harris (Harris Collection, Index, MCZ). These are marked "Types" in his collection. Two other Harris' specimens in the Types Collection are from New Hampshire (Dublin, 1835, sent to Harris by Leonard, according to his Index). It appears that the actual type locality for metacomet should be both Massachusetts and New Hampshire. In late 19th century Massachusetts, Scudder found that Dun Skipper was common and widespread, having been collected “even in such elevated places as Amherst (Parker), and Mount Tom (Dimmock)," and that south of 43º latitude (southern New Hampshire) it was "found everywhere, always rather common and sometimes, as in Nantucket, abundant” (1889:1741-2). Dun Skipper no doubt benefited from the land clearing that took place as agriculture spread 1600-1850 (Table 1), even if some wetlands were destroyed. F. H. Sprague collected multiple specimens of Dun Skipper in Wollaston (1883, 1896), Milton (1895), Malden (1883, 1895, 1896), and Boston West Roxbury (1883). He also documented it from the Connecticut River valley, north to south, with specimens from Montague (1885), Amherst (1885, 1886), and reportedly also Belchertown and North Leverett in 1878 (MCZ specimens; Sprague 1879). Other interesting 19th century specimens in the MCZ are one from Warwick in Franklin County from "Miss Edwards," and one of Scudder's own specimens from Nantucket. By the early 20th century, there are MCZ or Yale specimens from Tyngsboro near Andover (1914, 1916), Weston (1920's, C. J. Paine), Canton (1921, P. S. Remington, Fall River (1936, W. P. Rogers) and Westport (1945, W. P. Rogers). Farquhar (1934) tells us that additional specimens existed from Southbridge, Dorchester, Lake Quinsigamond near Worcester (Forbes), Chester in the lower Berkshire foothills (C. W. Johnson), Woods Hole on Cape Cod (Forbes), Marblehead (F. H. Walker), Lynn and Stoneham (C. V. Blackburn) in Essex County, and Phillipston in Worcester County (H. H. Shepard). Dun Skipper was shown to be present in most areas of the state. On the islands, Jones and Kimball (1943) reported that Dun Skipper was "general and common" on Nantucket (as Scudder had said earlier), and "general in distribution, sometimes in swarms at Aesclepias flowers" on Martha's Vineyard. For Nantucket, four specimens are in the Kimball Collection in the Maria Mitchell Museum on the island, and a 1945 C. P. Kimball specimen is in the MCZ. For the Vineyard, an F. M. Jones specimen (7/15, presumably 1930's) is in the Yale Peabody Museum. Dun Skipper appears to have remained common through the 1950s, 1960's and 1970's. C. G. Oliver collected it in Acton, Belmont, and Boxborough in the 1960's (Yale). William D. Winter collected specimens in Dover, West Medway and Westwood in the mid-1970's (Harvard MCZ). Evidence from higher-elevation western Massachusetts dates from 1962. At Yale are specimens from Richmond (1962, O. R. Taylor), Becket (1974, L. F. Gall), and October Mountain (1974, L. F. Gall) in Berkshire County, and from Heath (1981 and 1983, S. D. Coe) in Franklin County. It is amazing and unfortunate that the exact host plant used by Dun Skipper in Massachusetts is not known. However, the Connecticut Atlas found an egg or larva on sedge (Carex stricta) and on panic grass (Panicum spp.) in the wild, so perhaps these are the hosts in Massachusetts as well. In most of the literature, various sedges are listed as the sole host plants; Scott (1986), for example, lists several sedge species, of which only Carex lacustris occurs in Massachusetts. Dun Skipper is commonly raised on yellow nut sedge (Cyperus esculentus) in the lab (e.g. Heitzman 1964), and it may use that widespread native sedge in nature as well. Several authors (Layberry et al 1998; Cech 2005) speculate that given the Dun Skipper’s abundance and varying habitats in eastern North America, it is likely using some grass species as well as sedges. Purpletop (Tridens flavus) has been reported for the Philadelphia area (Shapiro 1966) and for western North America, and now Panicum is reported for Connecticut. Field research in Massachusetts is needed. Although the Dun is associated with wetlands and wetland edges, and apparently uses mainly sedges as host plants, it moves readily to adjacent uplands, including some disturbed areas and successional habitats such as roadsides, utility corridors, and gardens, where there are nectar sources. Some sources (O’Donnell et al. 2007) also stress woodland edges; Mello and Hanson (2004:65) report salt marsh edges on Cape Cod. Scudder (1889: 1742) observes that Dun was “…particularly attracted by the flowers of mint, fireweed and Indian hemp.” Other commonly-used nectar sources are milkweeds, purple vetch, New Jersey tea, knapweed, and self-heal. MBC sight records 1992-2009 do not suggest any pattern of increase or decrease in the numbers, but rather fluctuations every few years (Chart 107). Similarly, list-length analysis of MBC 1992-2010 data did not show any significant change in the detectibility of Dun Skipper over these years (Breed et al. 2012). This seems to have been a fairly stable species. In Connecticut Dun Skipper is perhaps even more abundant than here. 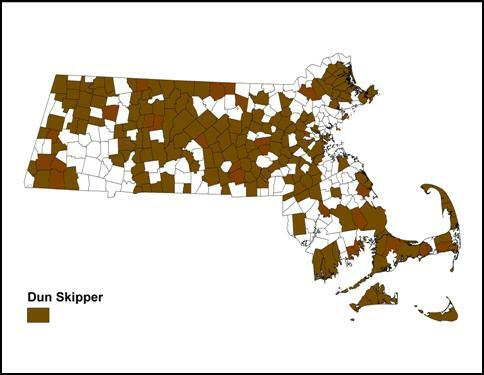 The Connecticut Atlas comments that “It is probably the most frequently encountered skipper in yards, especially in wooded regions.” There is even a suggestion of population increase in that state, with 188 project specimens compared to 111 pre-project. The 1986-90 Atlas had found Dun Skipper “apparently less common” on outer Cape Cod, Martha’s Vineyard, and Nantucket. More recent data show that in fact it is quite common in the first two areas, and probably Nantucket as well, but that the Outer Cape especially may be subject to some strong population fluctuations. In 1997, 1998 and 2001 the Outer Cape NABA Count reported quite large numbers of Duns (79, 83, and 52). After that, Count circles were re-drawn on the Cape, and the Outer Cape area is now divided between the Truro and the Brewster Counts. For many years the high numbers for Dun Skipper were not repeated on either of these Counts. But between 2010 and 2013, numbers counted in the Truro/Provincetown area (Truro NABA) were relatively high: 28 on 7/9/2011, 40 on 7/7/2012, and 34 on 7/13/2013, with 2-3 observers. And with more observers, high numbers were also reported from the Brewster Count (which includes Wellfleet Bay WS): 64 on 7/17/2010, 30 on 7/23/2011, 40 on 7/21/2012, and 40 from Wellfleet Bay WS alone on 7/10/2013, M. Faherty, who said they were "all over the driveway privet and the lavenders." Dun Skipper is common to abundant on Martha’s Vineyard, as shown in the NABA Count results. It has been reported every year since since the count inception in 1999, usually in large numbers (high counts 119 on 7/11/1999; 102 on 7/20/2013). On the 2008, 2007, and 2006 Counts, Martha’s Vineyard recorded the highest number of Duns of any of the 17 counts in the state, while at the same time having an average or below-average number of participants and party-hours. For example, in 2007 Martha’s Vineyard (23 party-hours) logged 96 Duns, while Blackstone Corridor (39.5 party-hours) logged 84, and Central Berkshire (33 party-hours) logged 63. Dun Skipper is also very common in the Berkshires. The Central Berkshire count records high numbers in most years (high counts 245 o 7/20/2013, 237 on 7/21/2012; 121 on 7/18/2004). Good numbers, sometimes triple-digit, are also usually reported from the Northern Berkshire (high count 352 on 7/14/2012), Southern Berkshire, Central Franklin, Northern Worcester, Northampton, and Blackstone Valley Counts. Northern Essex, Concord, Foxborough and Bristol average smaller numbers. BOM-MBC has several Dun Skipper records from Nantucket, the latest being 2 at Tuckernuck 7/2/2011, M. Pelikan, and "present on the island" 2011, E. LoPresti. The Atlas also had two Nantucket records. Scudder (1889) had reported it as “abundant” there. The Atlas also had two records from Naushon Island (town: Gosnold) (Mello 1988), and one from Thompson Island (town: Boston). Worcester Broad Meadow Brook WS, 12 on 7/29/2001 G. Howe; Woburn Horn Pond Mountain, 12 on 7/8/2006 S. Moore and B. Volkle; Williamsburg Graves Farm, 30 on 7/11/2010 B. Benner et al. ; Windsor Notchview, 66 on 7/27/2011, T. Gagnon and F. Model; West Boylston Gate 35, 12 on 8/3/2002 T and C Dodd et al. ; Wellfleet Wellfleet Bay WS, 62 on 7/17/2010 M. Faherty; Wales Norcross WS, 57 on 7/14/2011, E. Barry et al. ; Upton Chestnut St Gas Line, 14 on 7/18/1999 T. Dodd and B. Cassie; Sherborn power line, 24 on 7/25/2005 B. Bowker; Sharon Moose Hill Farm TTOR, 21 on 8/1/2009 E. Nielsen; Sheffield and Ashley Falls, 30 on 7/27/2013, M. Arey and A. Grkovich; Princeton Wachusett Meadow WS, 50 on 7/29/1997 J. Choiniere; Petersham Gate 36, 25 on 7/17/1999 D. Small; Paxton Moore SP, 64 on 7/13/2013 E. Barry and G. Kessler; New Ashford Mt. Greylock, 12 on 7/17/2004 E. Nielsen; Newburyport Maudslay SP, 30 on 7/7/2012, B. Zaremba; Mattapoisett Nasketucket SR, 19 on 7/21/2013, J. Dwelly; Milton power line, 20 on 7/29/2000 B. Bowker; Leicester Worcester Airport, 7 on 8/9/2003 D. Price and E. Barry; Lee October Mountain SF,10 on 7/12/2007 T. Gagnon and R. Cloutier; Hopedale Draper Park, 19 on 7/29/2000 T. and C. Dodd; Hingham World's End TTOR, 27 on 8/8/2004 B. Bowker; Harvard Oxbow NWR, 30 on 7/18/2004 T. Murray; Grafton Dauphinais Park, 13 on 7/30/2003 W. Bosse, W. Miller, E. Barry; Edgartown Katama Plains, 14 on 7/18/1998 M. Pelikan; Edgartown SF, 55 on 7/19/2003 M. Pelikan; Cummington, 30 on 7/21/2005 B. Spencer; Charlton power line, 47 on 7/26/1997 R. Hildreth; Carver Myles Standish SF, 25 on 6/27/2010 M. Arey; Canton Great Blue Hill, 24 on 8/3/2003 E. Nielsen; Burlington Mary Cummings Park, 15 on 8/11/2001 M. Rines; Belchertown Quabbin Park, 33 on 8/4/2002 M Lynch and S Carroll; Barre Ware River Watershed, 63 on 8/5/2001 M Lynch and S Carroll; Ashfield Bullitt Res., 18 on 7/6/2012, T. Gagnon and J. Richburg; Adams Greylock Glen, 5 7/17/2004 E. Nielsen. Dun Skipper apparently has one long brood, flying, according to MBC 1993-2008 records, from late May (a few) to the third week in September. It peaks and becomes abundant during the last three weeks in July (http://www.naba.org/chapters/nabambc/flight-dates-chart.asp). Earliest sightings: In 23 years of BOM-MBC records 1991-2013, the six earliest "first sightings of the year" are 5/23/1998 E. Longmeadow K. Parker; 5/25/2009 East Longmeadow K. Parker; 5/28/1999 Newbury S. Stichter; 6/3/2010 Sherborn power line, B. Bowker; 6/10/2000 Westwood Hale Res. E. Nielsen; and 6/12/2004 Warwick, S. Heinricher. The more recent years have not produced earlier sightings of Dun Skipper, as they have for many butterfly species. Over a century ago, Scudder wrote that Dun Skipper “generally appears on the wing during the very last days of June, occasionally as early as the 22d , becomes abundant in early July, is generally rubbed ---at least this is true of the male---by the middle of July, and continues in scanty numbers until the middle, occasionally as late as the third week of August” (1889:1742) (emphasis added). The onset of the flight period would appear to have advanced significantly since Scudder. As with Northern Broken-Dash and Little Glassywing, there are now a few sightings occurring as early as May, rather than June. And in eight of the 23 years 1991-2013, the earliest report of Dun Skipper came prior to Scudder's June 22 date. Latest sightings: During this same 23-year period, the six latest "last sightings of the year" are 9/25/2010 Wayland , E. Nielsen et al. ; 9/20/2009 Whately, B. Benner; 9/19/2002 Falmouth, A. Robb; 9/16/2007 Hubbardston Barre Falls Dam, B. Walker et al. ; 9/12/1997 Sherborn, R. Hildreth; and 9/10/2000 Easton, B. Cassie. The flight period appears to be lengthening in comparison to Scudder’s report that Dun Skipper was occasionally seen as late as the third week of August. In ten out of the 23 years under review, the last sighting was reported in September rather than August. This pattern of flight extension into September is also seen in the records for Long Dash and Northern Broken-Dash, but not for Little Glassywing. For Long Dash, the later flights indicate an additional brood; whether this is the case for Northern Broken-Dash and Dun is uncertain. Like Northern Broken-Dash and to a lesser extent Little Glassywing, Dun Skipper is wide-ranging and adaptable. Cech (2005) remarks that “No other Euphyes is as broadly adaptable or widespread.” NatureServe (2010) ranks it as S5 or “secure” in Massachusetts and Connecticut. As climate warms, this species may be expected to do increasingly well in Massachusetts (Table 6). As far back as the 1960’s, Shapiro (1966) reported two broods in the Philadelphia area, and Heitzman (1964) in the midwest north to Iowa. In the southeastern states it has two, and at least three in Florida. This species might adapt to major climate warming by increasing the number of broods.